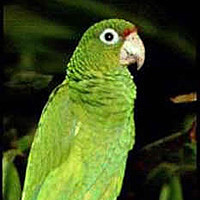 The international open-access journal GigaScience (a BGI and BioMed Central journal) has announced the publication, on September 28, 2012, of a unique study providing the genome sequence of the critically endangered Puerto Rican Parrot (Amazona vittata) by Dr. Taras Oleksyk and colleagues at the University of Puerto Rico-Mayaguez. The sequencing and analysis of the genome of the only surviving native parrot in U.S. territory provide numerous benefits for avian genetics, conservation studies, and evolutionary analyses. What is remarkable here, and highlighted in an accompanying commentary by Dr. Steven J. O'Brien of St. Petersburg State University, is that it shows how accessible genomic technology has become. With the human genome project taking a consortium of the leading international genome centers a decade and $3 billion USD to carry out, just over a decade later the genome of the Puerto Rico parrot was assembled at a small institution in Puerto Rico, and completely funded by the community. Money was raised in a variety of creative ways, including student organized art and fashion shows (see: http://youtu.be/tXW-pNoM9uU), social-networking sites, and private donations from Puerto Rican citizens wanting to promote research on their local wildlife. This project serves as a signal that work on large-scale whole-genome projects is becoming more democratized, and opens the door for more creative input from outside the large genome centers. Dr.